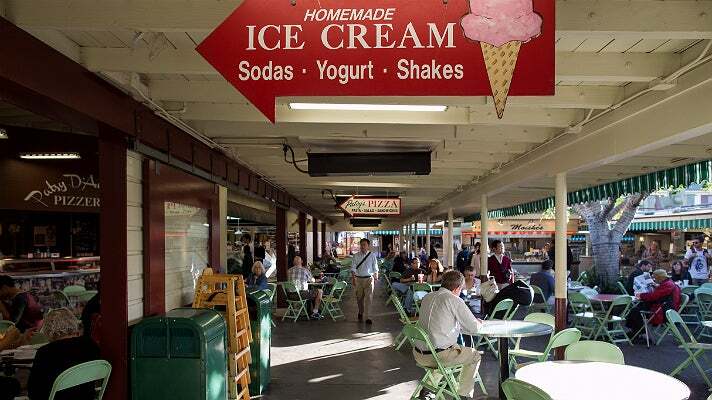 The open-air marketplace has welcomed visitors since 1934. 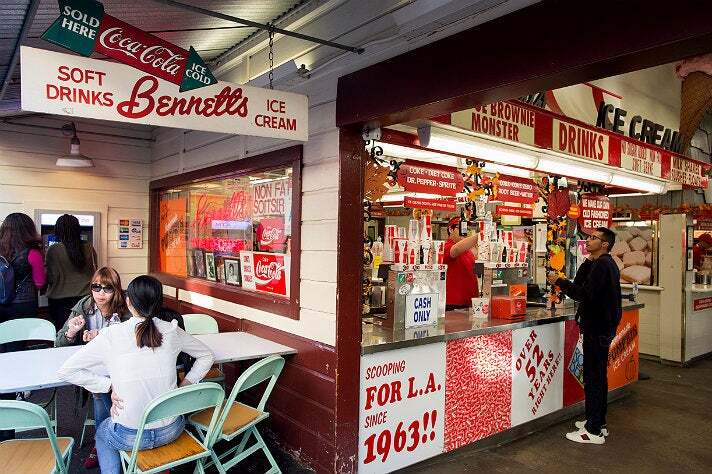 For generations of Angelenos and visitors, "Meet Me at Third and Fairfax" could only mean one thing: see you at The Original Farmers Market. Opened in 1934, the landmark open-air marketplace has welcomed everyone from President Eisenhower to The Beatles, Frank Sinatra and Marilyn Monroe. A star in its own right, the Market has appeared numerous times on Jimmy Kimmel Live, Entourage, and cooking shows with Alton Brown and Gordon Ramsay. 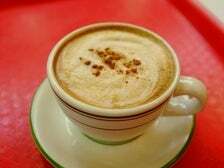 While there are familiar brands like Starbucks and Cost Plus, the Market's true appeal is in the dozens of food stalls and specialty shops. 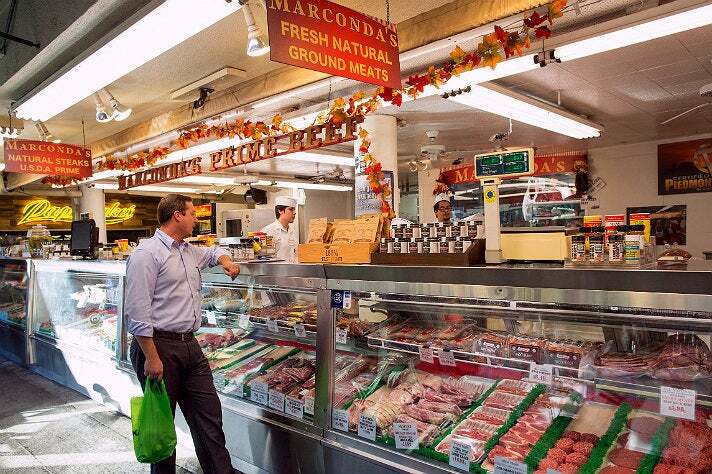 Many of these small businesses have been family owned and operated at the Market for decades. Day or night, there's something for everyone: Bob's Coffee & Doughnuts or Du-par's to start the day; unique shops like Kip's Toyland, Light My Fire and The Dog Bakery; multicultural eateries like Pampas Grill and Singapore's Banana Leaf. 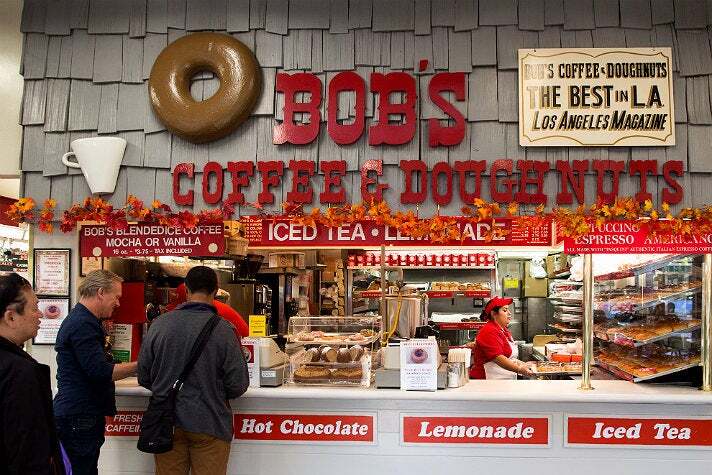 Bob’s Coffee & Doughnuts is an institution at The Original Farmers Market from Bob Tusquellas, who practically grew up at the Market. He worked at his family’s meat market and later operated the fish Market. He’s owned the donut shop since 1970. For each donut, Tusquellas convenes a committee with his wife, two daughters, and two grandchildren. Each new donut addition has to be agreed upon by unanimous consent. 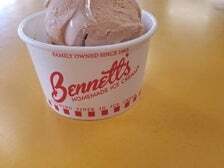 With a family history at the Market dating back to 1946, Scott Bennett and his staff at Bennett's Ice Cream make their own ice cream the old fashioned way: from fresh ingredients mixed on the spot. Don't miss the award-winning Cabernet Sauvignon sorbet. 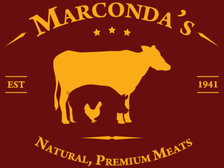 Established in 1941, Marconda's Meats is the oldest standing meat market in Los Angeles. On most days, customers will find two or three generations of the family working behind the counter. 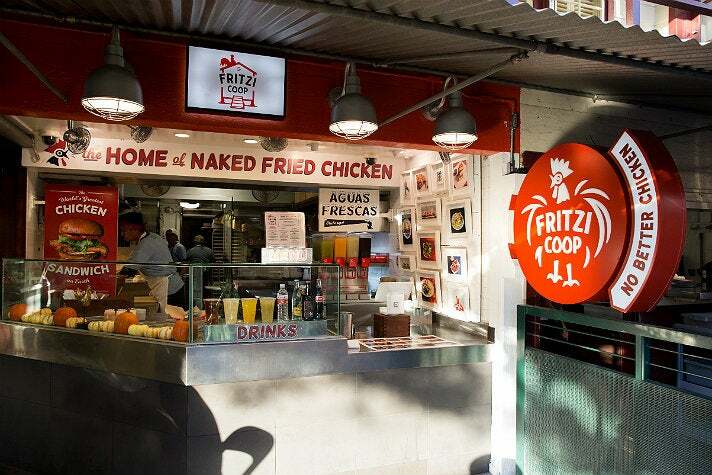 In September 2016, Fritzi Coop took over the former home of Fritzi Dog. Renowned Chef Neal Fraser (Redbird) serves a menu of delicious poultry plates, including house-made potato waffles, a variety of salads crafted with Fraser’s famous warm pulled chicken, antibiotic-free "Naked Fried Chicken," and a bevy of chicken sandwiches. Zia Valentina is owned by sisters Naomi and Dorit Simone Kashi. 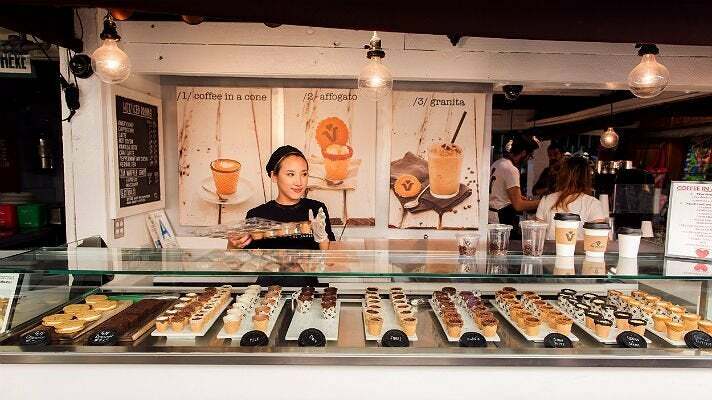 The innovative granita bar is inspired by their great aunt, Valentina (zia is "aunt" in Italian). Naomi says, "She came from Sicily and lived on this beautiful farmland. Everything she made came straight from her farm, what she cultivated." The eye catching nozzles on the back wall dispense various granitas, made fresh daily and sweetened with stevia instead of sugar. "Granita is a cross between a frozen yogurt and a smoothie, kind of a gourmet healthy version of a slushie," says Naomi. 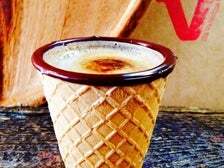 The signature Waffleshot is the ultimate cure for your caffeine fix: an espresso shot is served in a waffle cone that's hand-dipped in dark chocolate. 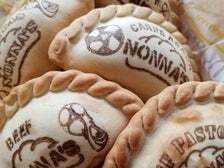 Offering one of the largest selections of baked empanadas in the city, from the traditional beef and chicken to unique fillings like macaroni & cheese and Philly cheese steak, Nonna’s offers an assortment of sweet options, including apple, Nutella and dulce de leche. 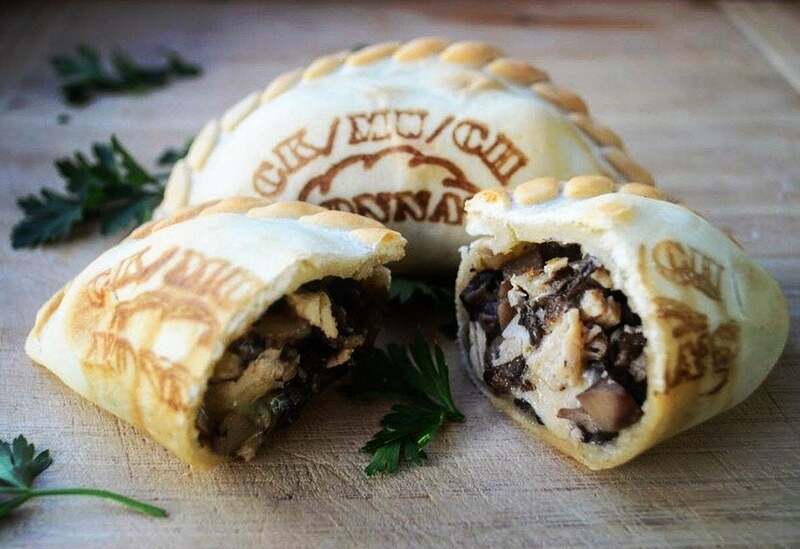 Traditional Argentine empanadas may be the star here, but the specialty merchant also sells a variety of salads, traditional desserts and even homemade jarred chimichurri sauce. Magee’s wide, superior variety of nuts has been a tradition (and a holiday staple) for decades. 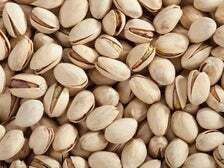 Pecans, walnuts, macadamias and several varieties of peanuts are all available by weight or in charming gift boxes. 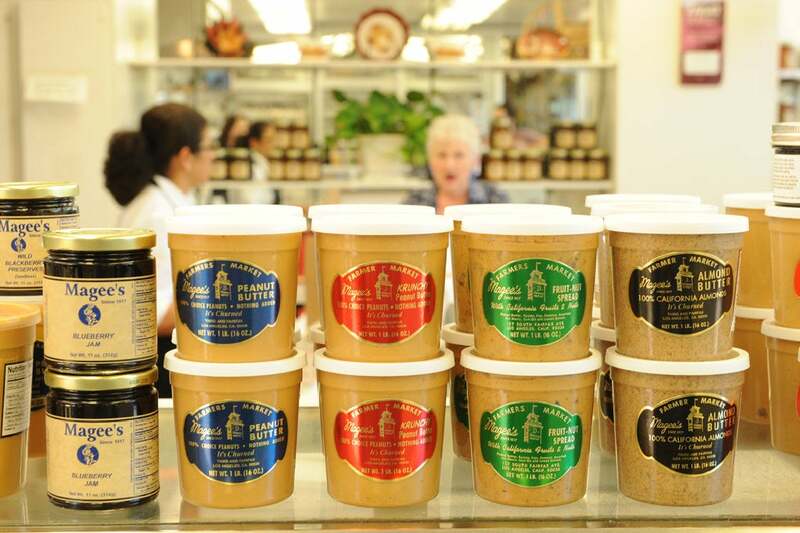 There’s a special treat here as well: the fresh nut butters are scrumptious and, if your timing is right, you can watch the machine, which makes fresh peanut butter and many of the other all-natural nut butters, work its magic. 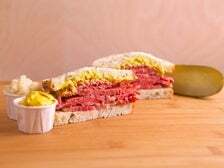 THE original Market restaurant– when farmers first parked trucks at Farmers Market, Blanche Magee thought they might like to have lunch, so she filled a picnic hamper and started feeding them. 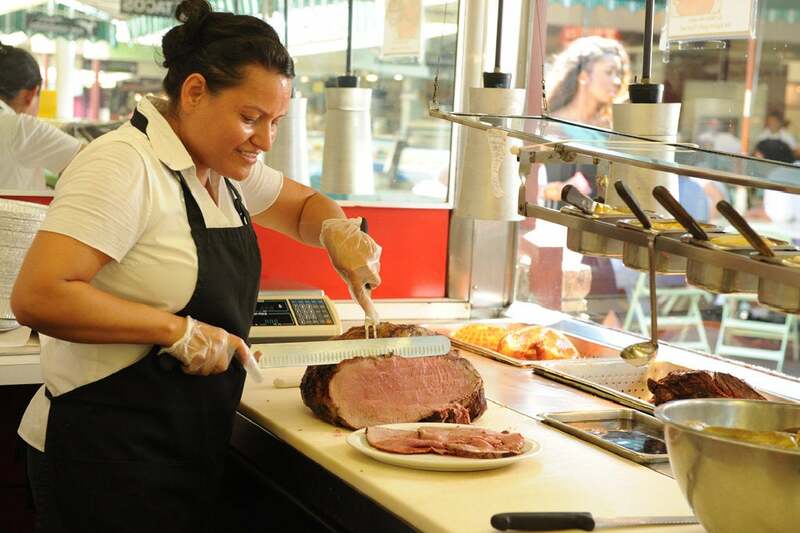 Today, folks still line up for outstanding roast or corned beef, tempting turkey and marvelous ham platters. Magee’s horseradish is homemade and fantastic, too, and the cole slaw is equally good.